I’m usually a pretty late starter when it comes to catching the holiday spirit. Some years it never seems to come at all. The more canned Christmas music I hear at the grocery stores, the more elusive the cheer can be. This year it hit early, December 8th in fact, and I never saw it coming. I’d been sick the whole week with a throat cold lowering my voice several octaves; which makes me sound mostly like Hilary Clinton I’m told. I was planning to spend the frigid evening inside, as the temperature was forecast to flirt with the zero mark for the first time this season. That’s no weather for a lady with the sniffles to be stepping into in a pantsuit. In fact, I’d just finished sending a concerned friend an email promising to stay off my bike until I was relatively healthy again. 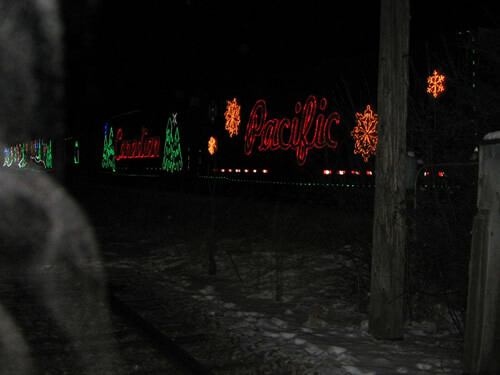 Then I heard the evening news announcing in fifteen minutes the Canadian Pacific Railway Holiday Train was stopping less than a mile from my house. I wasn’t even sure what the Holiday Train was or why I needed to see it so badly. Nevertheless in ten minutes I was on my bike sporting a mish-mashed winter outfit, haphazardly fumbling with my coat zipper, bound for the Milwaukee Road. It was easy to pinpoint the site of the stop as traffic was quickly building in the area and the conductor was blowing the welcoming horn wildly, adding to the already magical aura. The Holiday Train was decked out with glorious traditional Christmas lights. The slow movement of the cars as they rolled down the track made for a very effective means to view the entire display without stepping a foot and the attention to detail was enough to make Clark Griswold proud. A large crowd started to gather in front of a single car at middle of the pack. I made my way over quickly to investigate the scene. An entire side of the unique car started slowly opening from the top, exposing stage lights and smoke. The excitement escalated as the wall dropped down robotically to reveal a full band; all decked out in warm winter clothes proceeding to rock the railroad tracks. The singer’s amplified voice blared out as the crowd went loco for the magical locomotive. The look on the mesmerized children’s chilly little faces was incredible. I’ve never had kids and to be honest it’s been a long time since I’ve seen that look in a child’s eye at Christmas. Twenty minutes earlier I was home with my feet up settling in for the evening news and now it was like I’d stepped dreamily into a Terry Redlin painting. The Holiday Train is truly that unique and wonderful folks. See photos and video at dansbikerides.com. I stayed for three songs before my cough started to get the better of me and I headed for home. It was funny how I found many more homes had illuminated their Christmas lights for the ride home than on the ride out. Surely it wasn’t my imagination. The following day there was still a holiday skip in my step when I strolled into the supermarket (I know they don’t call ‘em that anymore) where there was a dear woman positioned alone at the Salvation Army kettle singing Christmas songs with the most lovely voice. It was a comforting deviation for my sensitive ears from the perpetually ringing bell. A five dollar bill almost magically leapt from my wallet into the familiar red money pot at her side, already heaping with cash. She returned a warm smile while singing right through a classic carol without missing a note. Merry Christmas everyone and thanks for riding along. Traffic Tip: Zero calm degrees can be much more comfortable riding than 20 windy degrees. Either is still worth the effort.